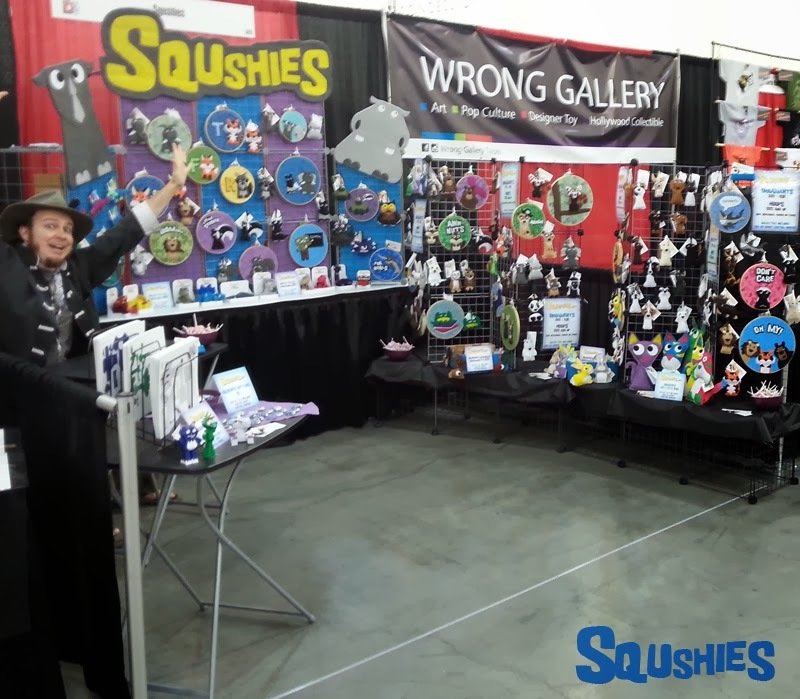 This past weekend we were at DesignerCon. This was our very first in person event with the Squshies. Most of the pictures I took were during set up. 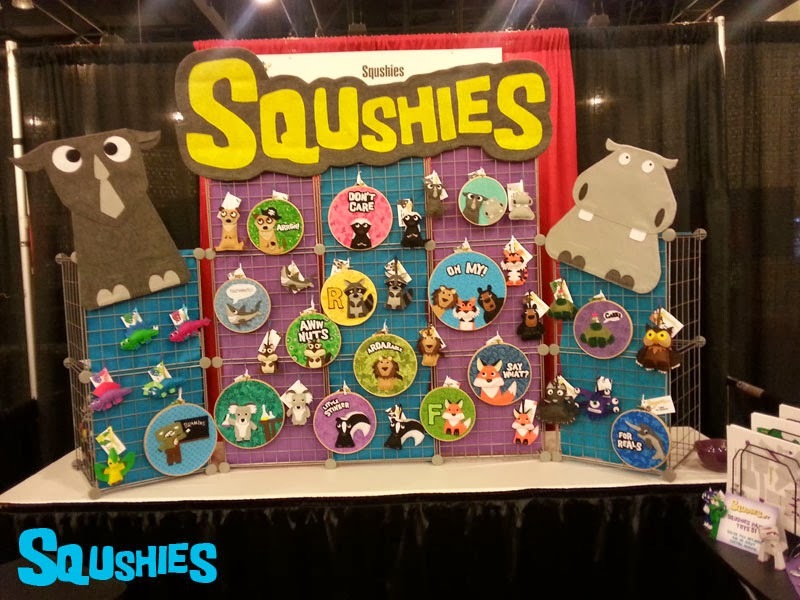 This was how our displayed looked on Saturday, a big back wall of Squshies and then 2 walls on the sides. We had a small table on the side to take a break from standing. I did some sewing at the table on Saturday, and Jason demonstrated needle felting on both days. People really liked seeing how the needle felted dinosaurs were made. A few hours into Saturday we did a little rearranging and brought our pin and paper toy table to the front because it seemed lost in the back. Once it was in the front there was a lot of interest in the buttons and paper toys. 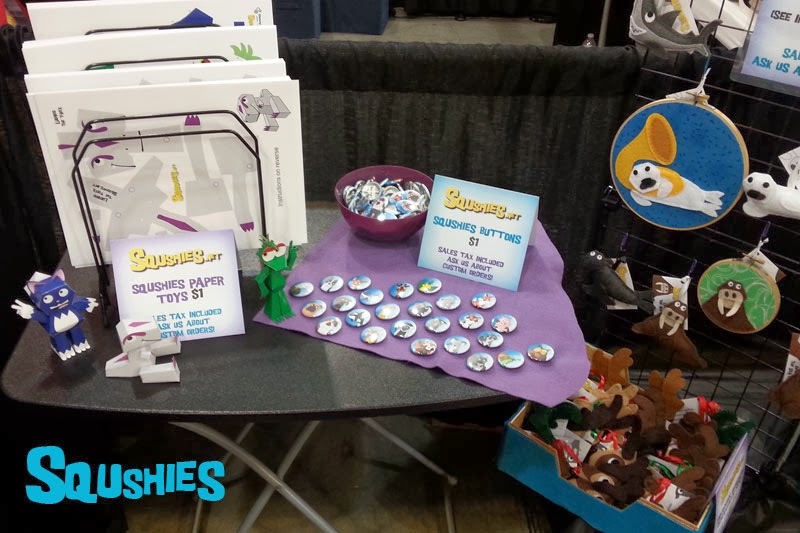 The paper toys got such a great reaction we are hoping to do more with them in the future. The 2nd day of Designercon we switched up our display a lot. On Saturday it felt like we constantly in the way. We moved both our side walls to one side and our little tables to other. It made the booth more open and easier for people to browse. This was the back wall of the display. We had the needle felted dinos here too, but we didn't take them out for set up day. We rearranged what was on this main back wall and the side walls throughout the weekend. 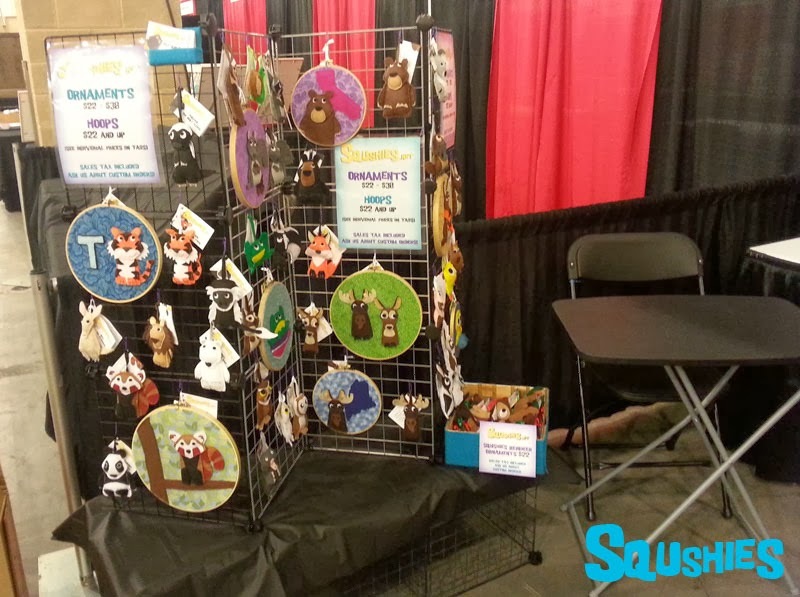 I made a lot of new hoop art right before this event. We had a lot of fun doing our first show. We learned a lot, met a ton of great people and we are looking into other shows for the future. Speaking of hoop art, I made a lot of new hoop art the week before the show. Seriously a lot of hoop art. They are so much fun to make. Once I sit down to work up sketches for a few I suddenly have a whole bunch and I can't wait to make them. All the hoops I have left from the show is listed either in the wall art collection of the shop. Last but not least, with it now being November it is time for the Holiday Cut Off Dates! We have no control over the post office so we can't guarantee delivery before Christmas but the chance of success is extremely higher if items are shipped by these dates. *Dates on custom Squshies are subject to change based on the volume of custom requests we receive. Please order early!